The day before I left Connecticut, I woke up at 4 a.m. to hear someone shouting my sister's name. It was my dad, and since my sister was deep asleep with her bedroom door closed, I ran out to see what was the matter. ... I need to go to the E.R. I woke up my sister, threw on some clothes, and helped Dad to the car. A half an hour later, he was on a hospital bed, being tested, poked, prodded, and questioned. Flashback to a few hours earlier. My father is diabetic, and has to regularly test his blood sugar levels. Whether you are diabetic or not, the things you eat and drink affect your blood sugar - but being diabetic means my father needs to be extra careful with what he consumes because his body simpldy does not make enough insulin to properly process glucose. In addition to the diabetes, my father has other health problems that have forced him to need to follow an exeptionally strict diet: he has to watch his sugar, sodium, protein, and liquid intake. The liquid is one of the biggest issues right now, as it is fairly new. Because of kidney failure, my father has to carefully restrict his liquid intake (even with watery foods - tomatoes, for example, count as liquids), and he has to go to dialysis a few times a week. My sister cooks on-plan meals for him and his brother drives him to the dialysis facility since he really can't drive himself anymore. Since he's started going to dialysis, he's felt better, because he's been more careful about his diet. How he feels is directly related to what he eats. And the night before we headed to the emergency room, his blood sugar tested so high, his home test kit couldn't even register the number. I gave him a shot of insulin to help regulate it, then waited an hour to test again. Still too high - more insulin, another hour. Finally, we got a numeric readout - it was over 500. To put this in perspective, a healthy/normal range is typically between 65 and 105. We waited another hour, and then it was in the 400s. Then the 200s. And then he felt better ... until 4 a.m., when he woke us up because he hadn't slept, and because he'd been having trouble catching his breath all night. We waited next to his bed as doctors and nurses filed in, one after the other, asking questions, drawing blood, checking his pulse and blood pressure. Finally, he fell asleep and the doctor said they would have him stay for observation now, but we could bring him to his scheduled dialysis later that day, and my sister and I could head home for a few hours to sleep. Upon returning, we found our father's bed missing from the E.R. The main doctor who had been caring for him said a bed had opened up and he was being dialysed on-site. 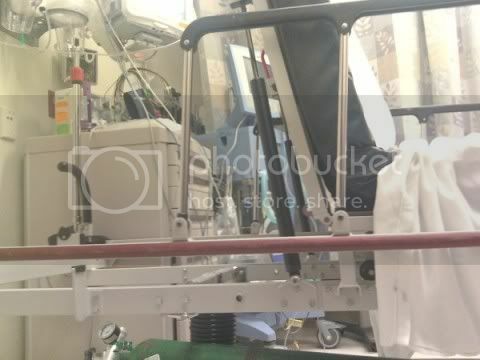 Dad was wheeled back in shortly thereafter, and after a few talks with several different doctors, it was decided that he didn't need to be admitted to the hospital overnight, but he *would* need an extra trip to the dialysis unit the next day. It was both a relief and a frustration. Good, because he was mostly fine and I could see him at home before I left. But tough at the same time, because the reason he ended up in the emergency room was, according to his doctor, "dietary indiscretion over the holidays." It's something bloggers have all been talking about since before Halloween - worries and concerns about overdoing it with our holiday eating. For me, it's an important concern, but not life threatening. For my father, though, it's near fatal. He consumed way too many liquids, and his body simply couldn't handle it. It doesn't matter how much he enjoys something - his body has limits and he has no choice but to respect them. There cannot be such thing as an off-plan day for him. One of the most stressful things about being home for me is seeing how my father takes care of his health - or, more honestly, how he doesn't. I laid out all his pills for him in his daily pill case, but he didn't always take them. He knew he can't be drinking so much, but he did anyway. It's incredibly tough not only to see someone you love deteriorate in front of you, but to know that there are things he could be doing to stay in his best possible condition, yet he chooses not to do them. It really made me think a lot about my own eating habits. Like I mentioned on Friday with my weigh in, there are a lot of weight-related health problems that run in my family, so I need to control what I can control and do whatever I can to stay as healthy as possible. Wow! Over 500 and that was after you tried to get the number down numerous times to read the number on the readout. I can't even imagine what it originally was. Scary!! So sorry you've had to experience all this. This situation is exactly what I fear with my father. How sad to read about your father and his failing health. It made me think back to my father who died at 46 from emphysema. He was a three pack a day smoker and I was 15 when he died. You would think I would have learned a lesson from all the awfulness I saw first hand but I was young and foolish and at 18 I decided it would be "cool" to smoke. Yeah. Very dumb. After 14 years of smoking, I quit when I was pregnant with my first child. We human beings are very fickle and foolish and we often think that bad things can't happen to us. I hope he gets better very soon. Oh, honey...I'm so sorry. You and your family are in my prayers. I understand what you're going through with your dad, too. My dad is 64 and he is 6'0" and weighs close to 450 lbs. He has every health problem under the sun, but refuses to lose weight because it'll cramp his lifestyle (he loves to eat fatty, unhealthy foods and sit around all day long). I've literally pleaded with him to change his habits in so many different ways, but he just tells me he'll work on it and then he just gains more weight. It depresses me. I kind of feel like I'm getting into shape to show him how he can do it too...like this is a last ditch effort to prove to him that HE can do it. I know I shouldn't think that way, but it's really all I can do to make myself calm down about his situation because he's literally eating himself to death. I am sorry to hear about your father. My father was diabetic as well and depended on insulin to eat as he pleased. I think they just give up and the only pleasures that they have are food and drink related so they choose that because it seems no matter what they do the condition still rears its ugly head. It's in my family too. Let's avoid it at all costs. Be well. My birth mother is a type 2 diabetic and she does nothing to take care of herself. I don't know if it's due to lack of education (she lives in Northern Ontario on an Indian Reservation so she's quite isolated), laziness, or that she just doesn't care. I'll likely never know since we aren't very close. That being said though, I know that diabetes is in my future too. She is my motivation to getting healthier and for that I am grateful to her. Thank you for sharing this with us Mary. Your dad is in my thoughts, along with the rest of your family. You've given me quite a bit to think about, I really appreciate that. Sending good vibes your way. I am so sorry that your father has to deal with this. Thinking of him and you. I'm so sorry Mary. It must have been scary. I don't have any answers, so many of my family don't look after themselves and I'm included in that. It's hard to deal with huh? I have some issues to that I have to watch our for in my family, so I totally understand this post. I'm know how scary it can be, my father has gone through similar health issues that cause him to be in and out of the hospital. It's hard to be so far away from him. I used to be a hemodialysis technician, so I know a lot about this. I can remember afyer the holidays when patients would come in having gained 8 kilograms from dietary indescretion. I cared very much for all of my patients (one even came to my wedding) and it was so hard to watch. It is so importtant to have support at home, and it's great that your sister does the cooking for him! You wil be in my thougts. It's interesting to see you draw the line connecting the dietary indiscretions that we all complain about from time to time to the choices that are harming your father. Because, it strips away the excuses. We all know that our dietary indiscretions aren't good for us, but rarely would we admit that they were actually harmful. But, seen in this extreme, you can't escape the damaging consequences of choices made. glad your dads gonna be ok, i've dealt with this type of behavior before. my grand-daddy was a diabetic alcoholic NOT a good combo! good luck and your dads in my prayers hon! I'm so sorry that you had to go through this. I hope that everything turns around soon! This is all so incredibly intense, and for you to be doing so well throughout it all is quite amazing. I cannot imagine what it's like for you to watch your dad go through this, when logically it seems so simple to make the right decisions and choices. My uncle is down a similar destructive path after having had a heart attack that nearly killed him, he has 2 young children with no life insurance and continues to smoke and eat crap food. It's actually so infuriating to me that I distance myself from him. I am just prepared that he will likely not be with us much longer since his heart is so unstable. I am so sorry that you had to experience this while you were home. I know how scary it must have been. 11 years ago my mom had double bypass heart surgery. She was 45 years old at the time. They told her that she needed to watch her weight, stop smoking (she's more of a social smoker) and exercise. She exercises and her job is physical but she doesn't seem interested in losing weight by trying to watch what she eats. She has this new heart and isn't taking care of it. And from time to time, she still smokes. I used to get on her case but have stopped. Not because I don't care but because she doesn't listen and it just creates animosity between us. It's hard to see her do this though. That makes me understand how she probably felt (or maybe even feels) with me gaining so much weight. It's hard to see someone you love not take care of themselves. But we can only worry about each other and hope that we can be an example to others by taking care of ourselves. how scary. im so glad he is ok (as ok as can be expected anyways). your last paragraph really made me think. its so easy to ignore problems that live in the world of "some day"....scary to think that it can really catch up with us. You must feel very helpless having to watch your dad go through this and not be able to do anything about it. So sorry. I'm glad that your dad is OK..or as OK as he can be. It must be very frustrating for him to have to be so careful with everything. I can't imagine having to deal what he has to deal with daily. I hope he will find the strength that he needs and that you do too.